We see that dimensioning a sound reproduction system for at least 120dB output capacity is reasonable and not overkill if realistic sound is the goal. So, how loud is it. What kind of sound level exposure is to be expected, and what sound pressure level should be used for system requirements. I did some measurements while playing music and movies, to show exactly how loud it is, at a reasonably loud level, and a little bit louder. This information can then be used to find requirements for loudspeakers, and also give a better understanding of why sound quality often is compromised. All measurements are done on a calibrated system. 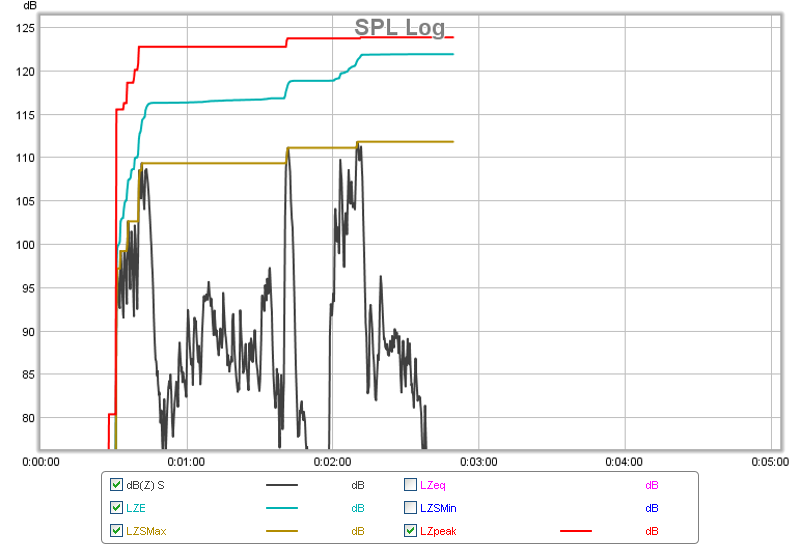 Using the -20dB RMS pink noise method and verified on frequency response measurements the calibration accuracy is within +-0.5dB, -20dB RMS equals 85dB from each main front speaker, 0dB peak level equals 105dB peak SPL. Played at 0dB, we can see the RMS sound pressure level varies from 75dB to 95dB, while peak levels approach 113dB. Not perceived as very loud, most will find it this to be a pleasant volume, and the bass has some physical impact and realism. At around time 02:30 level is increased to +8dB, and now it is quite loud, with RMS level above 100dB, and we can observe peak levels above 120dB. 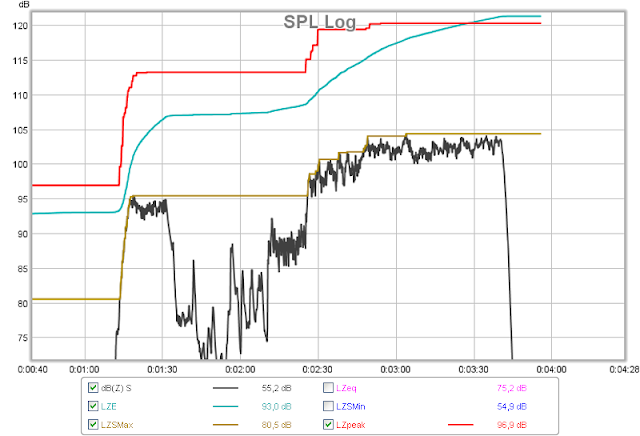 Another example, showing some of the problems with reduced sound quality in most newer recordings. First a good old one, then a newer from 2009, same artist, all played at 0dB. We see that the peak levels are the same, but the new recording is more compressed and has a louder RMS level, about 5dB higher. This higher RMS level means it is required to turn it down 5dB to maintain the same loudness, the problem then is of source that the peaks are also reduced by 5dB, and all the punch and impact and realism is gone. 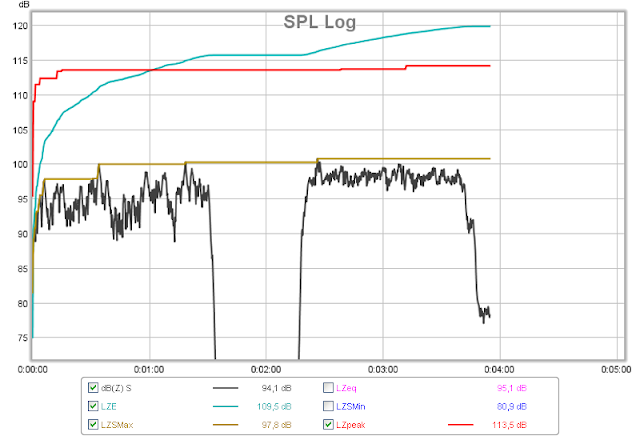 This recording shows the same peak level as the first example, around 113dB. The difference between the peak and RMS level is sometimes referred to as the "crest factor", a number that tells us something about how dynamic a piece of music is. Good recordings often have a crest factor of 20dB or more, while new popular music can have less than 10dB. The music examples analyzed here tells us that loudspeakers must be dimensioned for at least 113dB if we want to play music at around 90-95dB sound pressure level, and if we want to play loud, more than 120dB can easily be required. It is only peaks and transients of very short duration that reach those maximum levels, but the reproduction system must be dimensioned to be able to reproduce those peaks, or else the quality of the sound reproduction will be compromised. If the loudspeakers are not able to handle the peaks it will first start to sound more flat and the physical impact of drums and sound effects will be missing, and if you turn it up even further, it will start to sound bad due to distortion. Note that the black RMS lines in the graphs is SPL-dB(Z), meaning full-bandwidth measurements, actual sound level exposure for comparison to noise level standards are much lower when C or A frequency weighting is used. Master & Commander, DVD-version with the best sound, the cannon scene in the middle of the film. Here we see that the cannons peak out far above 120dB (124dB peak), but the RMS level is mostly at 80-95dB. This scene, played at 0dB as shown here, is not excessively loud, but the experience is realistic and powerful. The conclusion is that for realistic sound reproduction of music and movies it is required to have output capacity well above the average listening level, at least 20dB more for most good source material. The requirements given in the article How to set up a Home Theater Sound System, and numbers that can be found using the Audio Calculator are realistic and valid requirements, and dimensioning for less capacity will lead to compromised sound reproduction. This also gives us some clues for reasons why many claim it sounds "too loud" playing a move at 0dB, because the speakers may not be properly dimensioned and will distort the sound, and distorted sound is perceived to be "too loud". Other factors that affect perceived loudness is amount of early reflections and reverberation. The room needs to have acoustic properties suitable for sound reproduction for higher sound levels to be experienced as pleasant and not too loud.